Determines a local minimum of a given 1D function with the help of a bracketing of the minimum. This node uses the golden section search method. Formula that defines the objective function. The formula must contain one valid variable. Left point of the bracketing interval. Middle point of the bracketing interval. Right point of the bracketing interval. Local minimum of the objective function. A bracketing triplet (a, b, c) of a 1D continuous function f is a combination of three points with f(a) > f(b) and f(c) > f(b). This guarantees the existence of a local minimum of f in the interval (a, c). Beginning with a bracketing triplet (a, b, c), the golden section search method determines a new bracketing triplet with a considerably smaller expansion. Repeating this scheme often yields a good approximation of the local minimum. The following equation essentially calculates the new bracketing point. 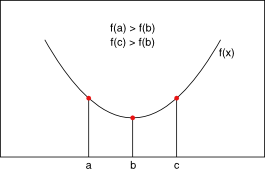 The following figure shows the relationship between a, b, c and f(a), f(b), f(c).